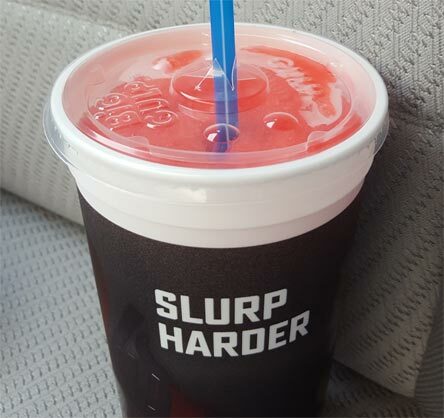 Everyone knows why Deadpool's suit is red, but do you know why his Slurpee is red? Hmm, yeah, that's not funny. Better question, why is the 7-eleven website useless? I just wanted to verify if this thing has caffeine or not.. The mutant site isn't any better... ok, the regular soda has caffeine.. wait, you stopped reading already didn't you? (cherry flavored) - wait, there are four other cup designs? I feel like I tried mutant soda at one point, but all you really need to know is that this tastes like cherry mtn dew. I mean more artificial cherry than real cherry, but that's the gist of it. I was a little scared after the first sip because I thought this was going to taste like every other fake citrus slurpee, but I did like (tolerate) it more once I had several sips in me. The truly biggest thing I want to get done is a 2018 product guide. Yes, you could just scroll through the last 5 months of reviews, but I really want a single post that you can reference and see how you are doing in your quest to try everything 2018 has to offer. But seriously, I've let myself push this off again and again and now it's June. I don't want to give up this tradition, though if anyone wants to chime in and say it doesn't really help anymore, I am open to thoughts and comments. P.S. Feel free to leave suggestions about what you think I haven't covered yet. I'd love to see your takes on Ben & Jerry's non-dairy line. To my knowledge they don't try at all to market themselves as low calorie or healthy, just vegan. I know it's not technically ice cream, but I've really enjoyed the almond brittle and 7 layer bar flavors and I'd be interested in your takes. Yeah, I should try at least one of the two new 2018 flavors. The problem is the nut factor, so I can only try it at work, but it's probably about time to give it a second chance. I'm thinking the cinnamon bun flavor?